A story equally full of action and character development. The people of Ronin Island learn what it means to truly care for those outside their group. 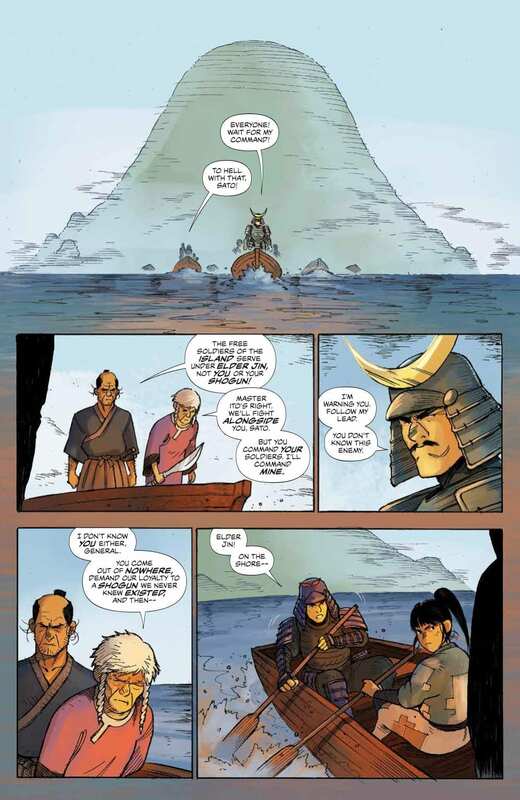 RONIN ISLAND #1 introduced us to Kenichi and Hana, two budding warriors training to become full-fledged samurais. But just as they’re undergoing initiation a samurai named Sato shows up and demands their allegiance to his Shogun and help them fight an army of zombie-like Byonin. Now the young warriors must join the fight and learn what it means to fight for a cause larger than Ronin Island itself. The community of displaced peoples on Ronin Island is in shambles. 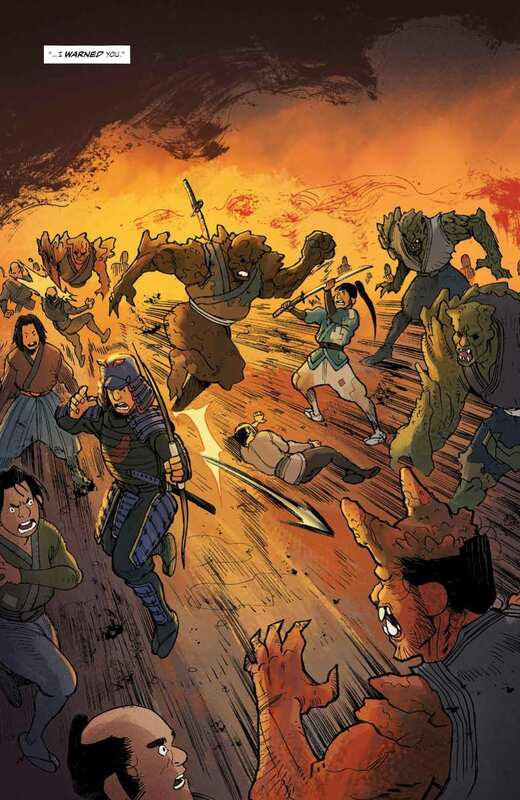 The Byonin are attacking villagers while a menacing army of samurais, lead by the General Sato, is forcing everyone to join their ranks. Elder Jin and Master Ito reiterate their community’s independence and free status, but Sato will have none of it. He believes they should be subjugated to his shogun, and he’ll use the Byonin threat as an extortion tool if necessary. After fighting the Byonin, Elder Jin decides to give into Sato’s demands for the sake of her people. 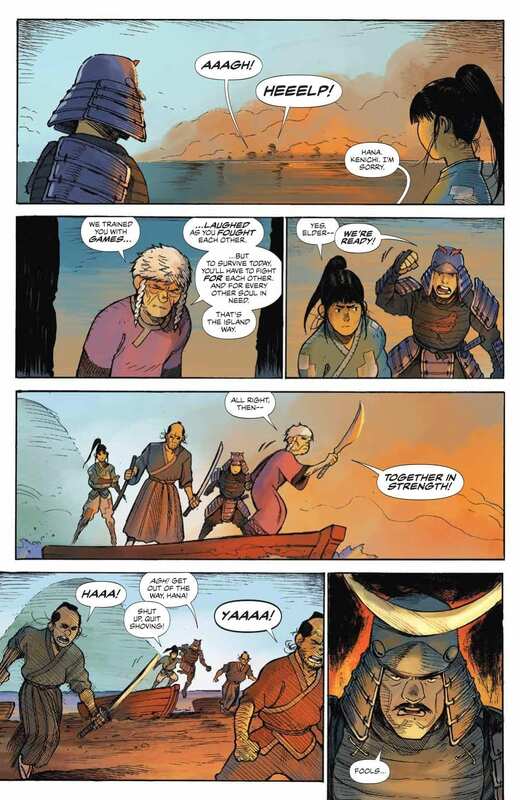 Thus, the once free Ronin Island warriors become subjects of the samurai and the unknown shogun. Hana and Kenichi, appalled at their people’s predicament, spend the next month plotting their escape from the island. Elder Jin’s famous mantra “Together in strength,” emboldens Hana and Kenichi’s resolve to free their people. But while attempting to escape Sato makes a surprisingly heartfelt plea, reminding them that his shogun’s people need help just as much as they do. Greg Pak poses an interesting moral quandary with this statement. 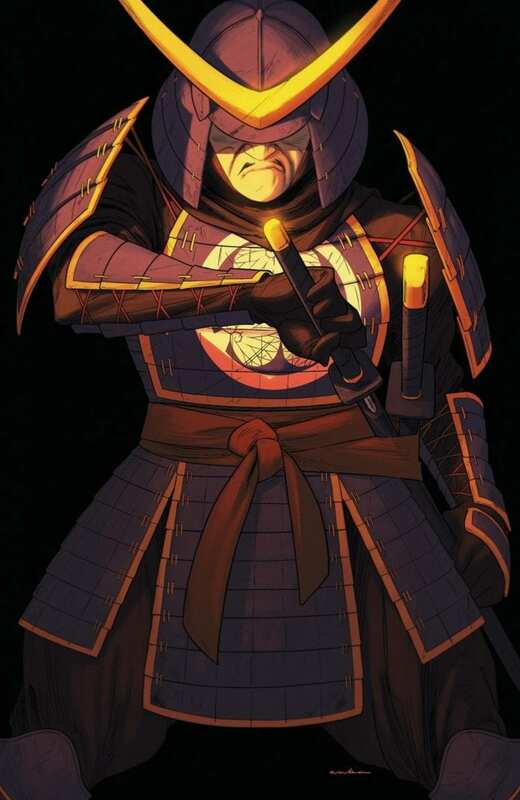 Do the people of Ronin only care about their own community? Does working together only apply to people in your group? Readers will join Hana and Kenichi as they consider how far their compassion actually reaches, especially in the midst of difficult situations. 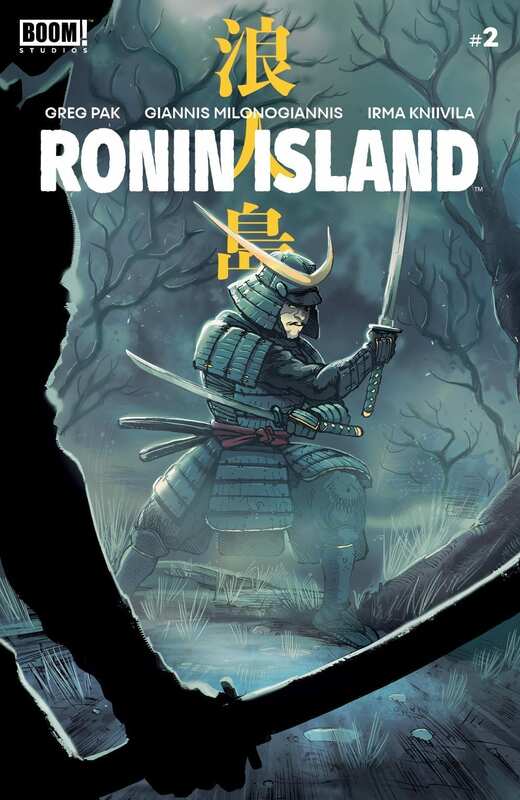 The three covers for RONIN ISLAND #2 place emphasis on a few of the more antagonistic figures in this series. Giannis Milonogiannis and Msassyk’s main cover and Kris Anka’s unlocked retailer variant cover both depict images of General Sato. The main cover shows the samurai in a defensive posture as a Byonin closes in. Anka’s Sato appears more menacing with his head tilted down and sword drawn. These covers show the different sides of Sato and emphasize how he’s become such a multifaceted character. Ethan Young also lends his preorder cover to mix. His work features a close up view of the Byonin’s face, giving readers a closer look at the formerly-human creature. 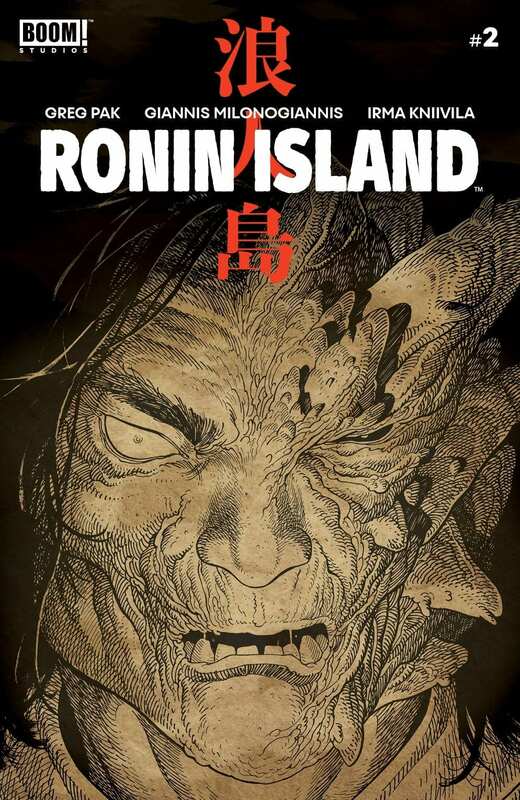 The artists telling the story of Ronin Island take this issue’s illustrations to a new level of gruesomeness with their depictions of the Byonin. Giannis Milonogiannis’ penciling highlights every gory sword slash as the islanders resort to such brutal tactics for survival. Irma Knivila applies various shades of orange to the Byonin blood to show how far they’ve moved beyond their human forms. Simon Bowland’s lettering does a great job of complementing Milonogiannis’ action scenes. 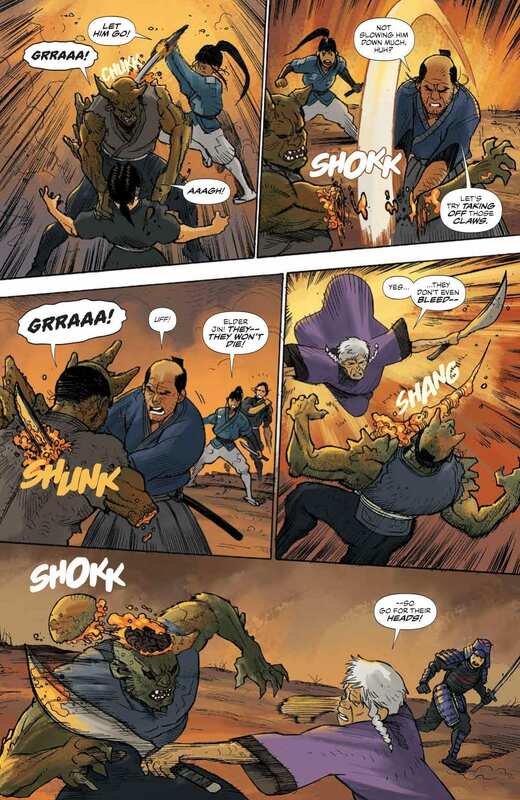 He transitions font styles and sizes seamlessly to produce battle sounds and cries in reader imaginations. RONIN ISLAND #2 shocks us, but not so as to drive one away. It’s a shock that, much like a doctor’s defibrillator, wakes us up to a world in pain. Compassion has no limits, and sometimes it takes a menacing General Soto to remind us. What did you think of General Soto’s character development in this issue? Let us know in the comments below!